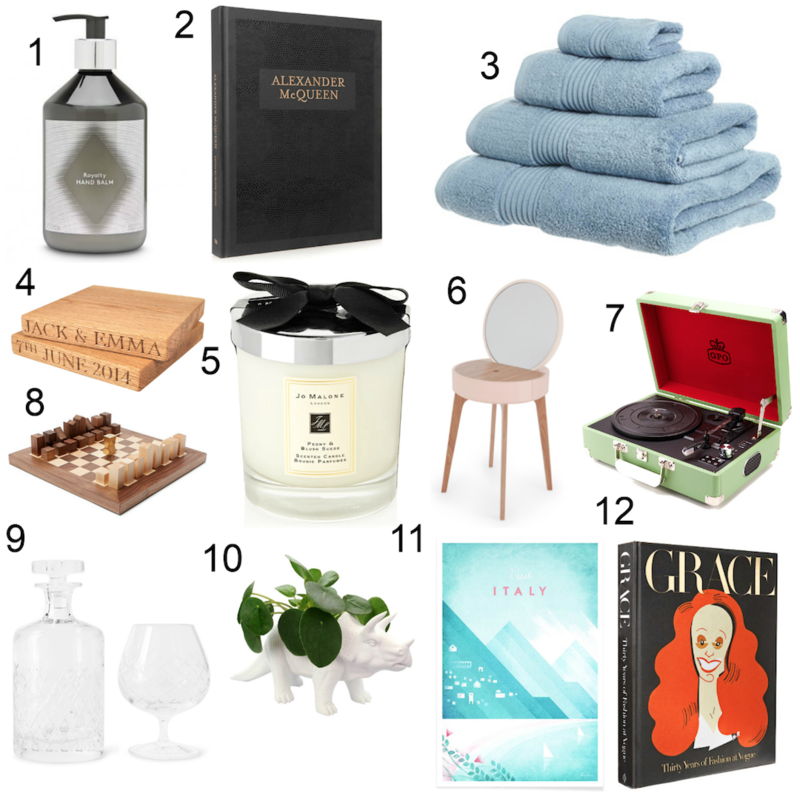 Buckle up kids it’s Christmas gift guide time!! I love creating these every year (previous ones here, here and here) not only because they appear to have been so helpful to you all in the past, but also because it encourages me to really seek out interesting pieces which I may not have sought otherwise – so woo for all our Christmas shopping baskets!! This first guide (as you can tell from the title!) is for the home. Think of the person in your life who loves to host the get togethers, who loves decorating (and redecorating!) their home and who just has to have things “just so”. We all know one of them right? Well hopefully these items help you to snap up their gift and tick them off your list. Click on the numbers above, or on the text below and get shopping! 1.) When you have people over, it’s lovely having a fresh hand towel and beautiful hand wash and moisturisers for your guests to use, gifting a pretty set of hand wash and balm will go down a treat and I mean, just look at that luxe packaging! 2.) Because everyone loves a coffee table book and Alexander McQueen’s pieces make even the least fashionista type say “wow!”, so it’s a great one for all to enjoy. 3.) Luxury towels don’t have to be overly expensive and they can be a super gift as a lot of us are guilty of holding onto our towels for far too long. A revamp at Christmas is perfect – especially when they are gifted to you! 4.) For the newlyweds you know – tick off two names with one, very thoughtful gift. 5.) Who doesn’t love the scent of a Jo Malone candle – honestly – they are the business and give any house or apartment that added bit of umph! 6.) For those who always say “oh I’d love a dressing table, but our place is too small”. No it isn’t, they just haven’t found the right one, this blush number will have them sorted in a jiffy and you’ll be the dreamboat who listened and found the perfect solution! 8.) My parents have had the same chess set in our family home since I was tiny, because of this, I think no home is complete without a set. Another great gift for the decorator, the newlyweds or the one who loves chess! 11.) I discovered Henry Rivers artwork about two years ago and I am besotted, I want the London one, the Barcelona one and the New York one – and I’m currently politely badgering him on Instagram to do a Dublin one!! 12.) Another coffee table book, but when it’s by Grace Coddington herself, I mean, you can’t not can you!?! I saw her once in London and nearly cricked my neck because I did such a dramatic double take – I still think it was worth it! More Gift Guides Coming Soon! Let me know if there is anyone in particular you’re struggling to find a gift for and I’ll see what I can do! I am defo going to be sending this to my boyfriend as inspo for christmas! Yes Ellie! Get yo fella on it!! I don’t think you can ever go wrong with Jo Malone at Christmas time! So true Danielle, they are such a great gift! These are cute picks dear, especially the vintage display piece. Such a nice piece to have at home.